The following menus and items are available via the Tools menu of the NinjaTrader Control Center. 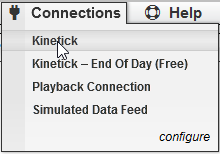 •You cannot remove the predefined constant connections: Kinetick - End Of Day (Free), Playback Connection, Simulated Data Feed. •You can connect to multiple connections simultaneously. •The connection status is reported to the left of the connection name in the connections menu per provider. There is also an aggregated connection status in the bottom left hand corner of the Control Center. For more information please see the "Connection Status" section of the help guide. 1.Click configure to define a new connection. 2.See the connection guide for your provider for detailed steps on how to setup your connection. 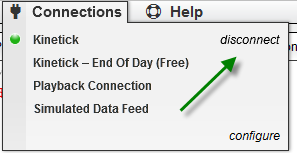 1.Click on the connection name to connect to the defined connection. 2.See the section "Connection Status" below for more information on connection status. 1.When you are connected to a provider in the Connections menu you will see disconnect for each active connection. 2.Select "disconnect" to disconnect from the provider. Although you will need to configure your own connection to a real-time market data provider and your brokerage account, NinjaTrader comes pre-loaded with several connections which can be used for different purposes.